An application that installs the most popular applications that you would want on a new computer without having to go through loads of different sites has proved to be popular in its first week since going public. 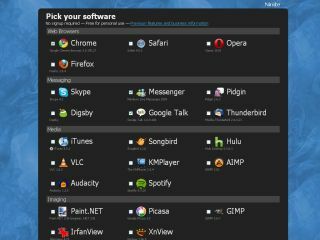 The 'Ninite easy installer' allows people to cherry pick their favourite apps, including Skype, Messenger, Open Office and iTunes, and then install them all in one fell swoop. The list of apps the installer includes is growing quickly and after a well-received private beta under the name of Volery. The app, developed in San Francisco, is 32-bit enabled only at the moment with 64-bit and business accounts in the offing. We've certainly not noticed any shenanigans - although we are obliged to point out that Future can't take any responsibility for other sites and downloads of course. Developer Patrick Swieskowski insists that the installs are simply the default installs of the programs listed, with none of those irritating add-ons like toolbars and installers. "We're very serious about just installing the apps you choose and nothing more, says Swieskowski in comments on How-to-geek. "We decline browser toolbars and other crap installers try to sneak in too. Volery itself isn't installed at all. We recognise running our installer requires a lot of trust, and we intend to earn and keep it." The thought of running PCdecrapifier followed by Ninite to get our Windows 7 computers up to speed and bloatware free is certainly appealing. And, of course, you could always take a look through our list of 12 hot (and free) apps to power up Windows 7, as well.